From a very young age I have always been fascinated in Space and although being an Astronaut is still on my list of things to do before I die (hurry up affordable Space Tourism!) the closest I can get to my dream is a visit to Kennedy Space Center at Cape Canaveral in Florida. My first ever visit was during my honeymoon in 2003 (on the day of a shuttle launch! ), my next visit was about 8 years later (I managed to persuade my wife that a second visit for the Up Close Tour and Lunch with an Astronaut was the ultimate experience for us) and this year took a bit more convincing to go again, although having a 3 year old boy meant my wife was out-voted! Kennedy Space Center is just an hour drive from Orlando and it wasn't long before we were driving over the Nasa Causeway bridge with Kennedy Space Center’s very visible sign and shuttle fuel tanks on the right as we approached telling us we’ve made it! We visited on a Tuesday and arrived around 10:30am - a quiet time to visit with parking close to the entrance. 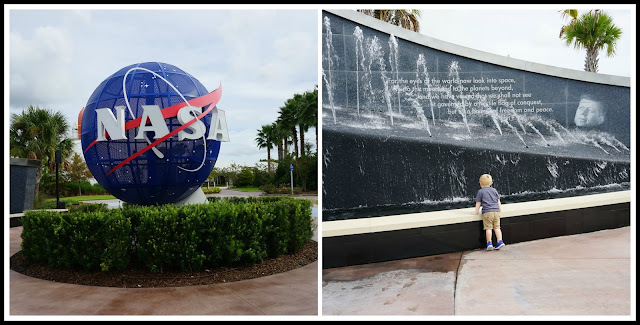 Being quiet meant this was a good time to get some great photos in front of the NASA sign. Once inside, we made a beeline to the bus tour to get an early start on the complex tour. The tour departs every 15 mins and you get a great running commentary from the bus driver throughout the tour. I recommend that you sit on the right hand side of the bus for the best pictures of the massive Vehicle Assembly Building but what you miss on the right hand side you make up for when passing the launch pad. (note: if you are on the left hand side, you get a great shot of the Assembly building on the return back to the main complex after visiting the Saturn V Center). It's worth noting that you can't take buggies on the bus tour and these need to be left at the buggy park but we found plenty of free rental buggies at the end of the tour. 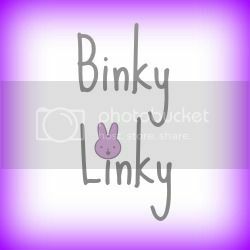 This is came in very handy when Elliot nodded off on the bus! The bus departs the main complex and you go through the security gates into the restricted areas where only employees and tour buses can go. On the tour you get to see the impressive Vehicle Assembly Building where the assembly of the retired Shuttle and Saturn V rockets were completed. The future Space Launch System (SLS) will also be assembled there and as you progress through the tour you can see preparations being made for the SLS launch pad. Being that the Vehicle Assembly Building is the largest single storey building in the world you can see this building from pretty much everywhere on the tour. The bus passes the launch pads and takes you to the Saturn V Center. The Saturn V Centre’s most notable attraction is the full size restored Saturn V rocket hanging from the roof above your head. As you walk from the very large engines the entire length of the rocket to the command module at the top you pass several other attractions including real peace of moon rock that you can touch, gift shop, Lunar Module simulator, lunar rover, van used to transport astronauts, Apollo launch room with simulated launch and two theatres. There is also an outdoor area which leads to seating area overlooking the launch pads and is a great place to eat your lunch with a great view of the nature reserve. Once you depart the Saturn V Center on the tour bus you may be lucky enough to see one of the Bald Eagles nesting before arriving back to the main complex. Since my last visit, a new attraction has been built - Space Shuttle Atlantis. This is a brand new dedicated building which has a full-scale, 184-foot-tall, upright, replica space shuttle stack, including external tank and two solid rocket boosters. Once inside you watch the multimedia presentation then the doors open to an impressive sight, something I was not prepared for. The actual Atlantis Shuttle rotated 43.21 degrees with payload doors open and its robotic arm extended. What an amazing sight, something worth the admission ticket alone. 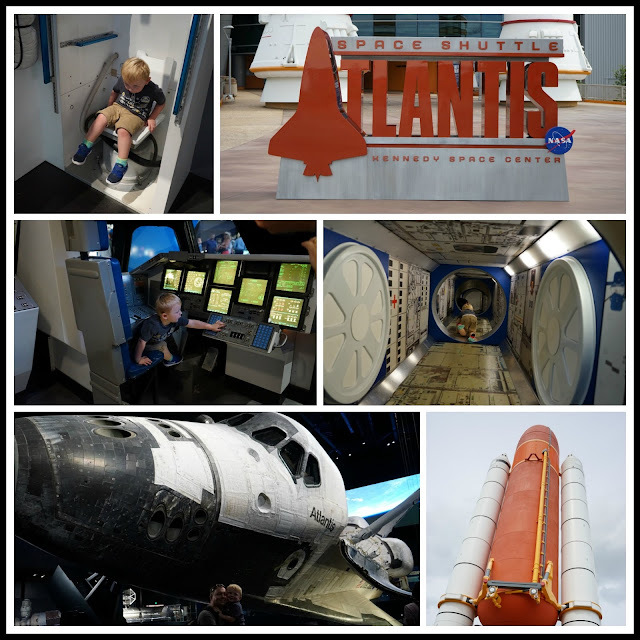 In the Atlantis building you get to play with the many interactive exhibits and end the amazing experience with the Shuttle Launch Experience. This is where you can experience a launch like an astronaut and trapped flat on your back, waiting in anticipation for a simulated shuttle launch. If you have little ones or prefer not to take part, you can watch from the viewing platform. No trip to Kennedy Space Center is complete without visiting the gift shop - also known as “The BEST gift shop in the world” to my little boy. Here we topped on on space food, books, pens, gifts for family, toy space shuttle for Elliot and if I was allowed, an adult space suit! 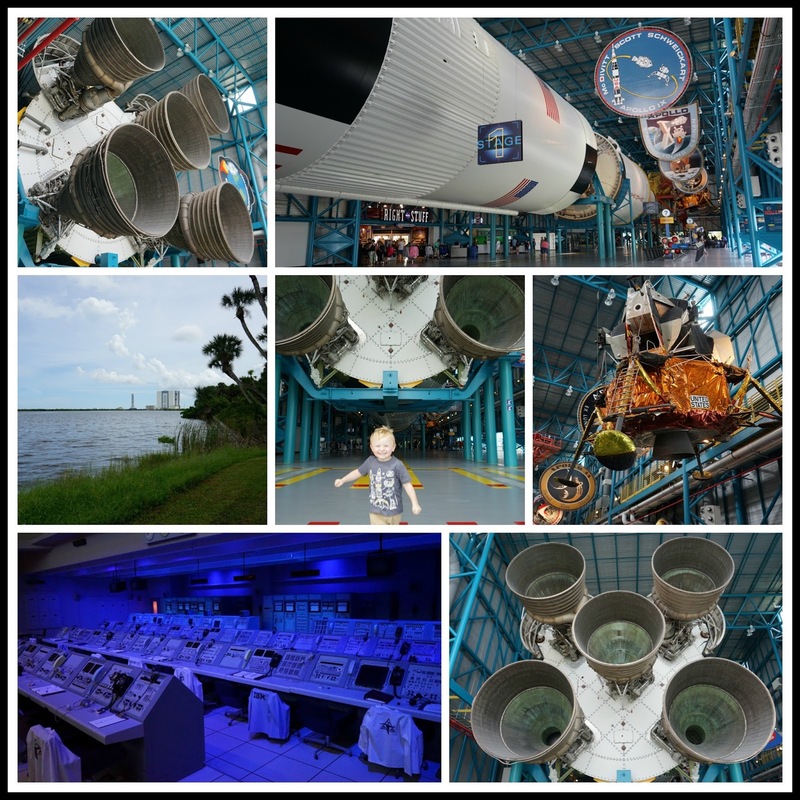 As we were nearing closing time, we wandered the amazing Rocket Garden which has lots of rockets to admire and our favourite attraction in the rocket garden was the escape module where Elliot loved sitting there upside down! 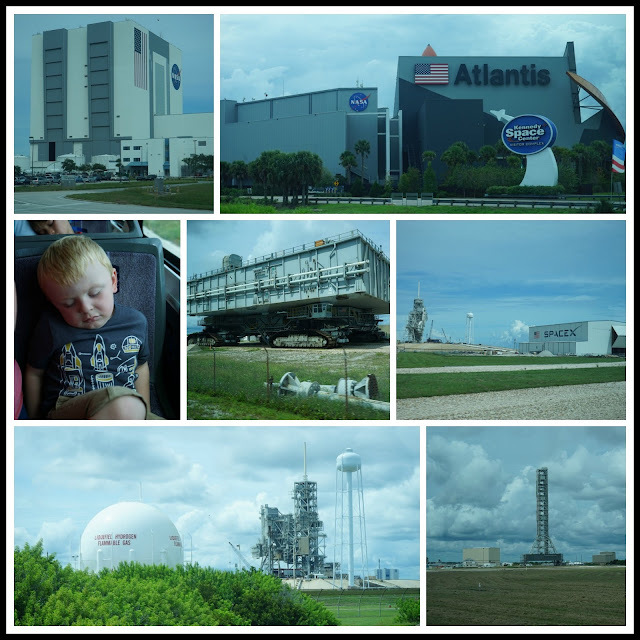 Kennedy Space Center is one of my favourite Florida attractions and a must see attraction for anyone visiting Orlando. Writing this review has now wet my appetite for my 4th visit! *We were given free entry for the purpose of this review but we have been 100% honest...and you can probably tell from the big smiles in the photos that we had a great time! 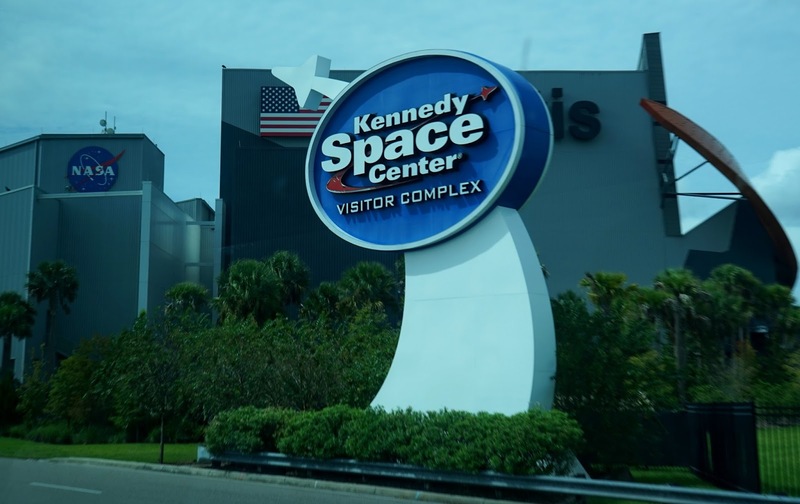 I'm a Florida native and Kennedy Space Center has always been on my list of To-Do's, but I just never seem to get around to it! I did visit the Air & Space Museum in Washington, DC and I did get to see the space shuttle Discovery, along with some amazing aircraft, but it's not Kennedy Space Center! Thank you for such a great review. It's only made me want to start seriously planning my visit. Oh wow! How exciting! What a fantastic place to visit! I have never been to America, so already have a few things on the list for when I do go the other way round the world - and this wasn't something i had thought of, but is now firmly on the 'things to experience in life list'. It looks incredible - and amazing to be so close to the rockets and understand how big they really are! Jealous! We should've gone with you! Our visit there was with others who were less than enthusiastic and I ended up a bit nonplussed. But, you've made me wish we made the effort to try again in February when we were in Florida! Thanks for linking with #daysoutwithatoddler. This is an epic day out for sure! Easter Gift Guide for Kids + Skateboard giveaway!